Arduino has become the most popular Microcontroller among students and hobbyists in very less span of time. So everyone try to use Arduino to make any project, as it is easy and having smooth learning curve. We have created many Arduino projects from basic interfacing projects to advanced robotic projects and IoT projects, you can check all of them in our website. 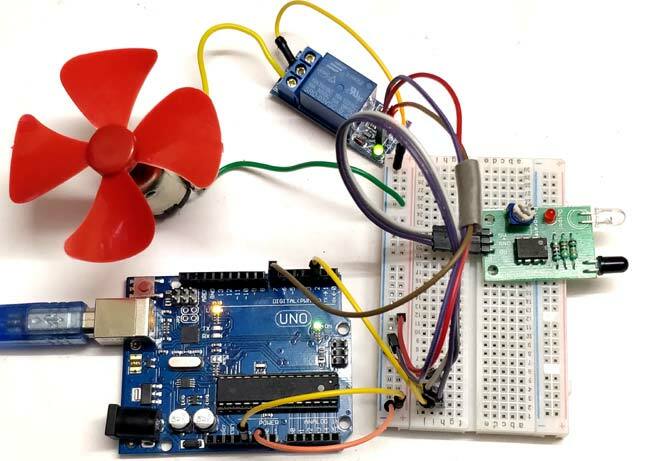 Today we are making a simple project with Arduino which uses three basic components that are IR Sensor, Relay Module and DC Motor. Here we will interface IR sensor with Arduino to control DC Motor. Here IR sensor will detect any object in front of it and Arduino will read the IR Sensor’s output and make the Relay High. Relay is further connected to DC Motor, so DC Motor will be ON whenever IR Sensor Detects any objects in front it. In circuit, IR sensor Module output pin is simple connected to the Pin 2 no of Arduino and Relay Module’s input is connected to Pin 7 no of Arduino. Further a DC Motor is connected to the Relay. Code for this project is very simple. Complete Arduino Code with Demo Video is given at the end. Here we have connected IR sensor output pin to Pin 2 of Arduino. So whenever IR sensor detects any objects Pin 2 of Arduino will be high and based on that Relay will be turned on which is connected to Pin 7 of Arduino. Working of this project is straight forward. Whenever there is some object in front of IR sensor, it will detect that and make the output pin high. IR sensor’s output pin is connected to Arduino, so Arduino will read it and activate the Relay module by making pin 7 high. As soon as relay is activated, it will turn on the DC motor. When there is no object near IR sensor, the output of IR sensor will remain low and DC motor will also remain in Off state. The sensitivity of IR Sensor can be adjusted using the potentiometer on the module itself. Sensitivity simply means the distance from which it can detect the object. Complete Arduino Code and demo Video for the project are given below.